On board the papal plane to Chile, the Pope explained why he wanted to share a photo of a Japanese boy waiting at a crematorium in Nagasaki to bury his baby brother. As he boarded the plane for Chile on Monday, Pope Francis spoke of his fears in the face of threats of nuclear war. 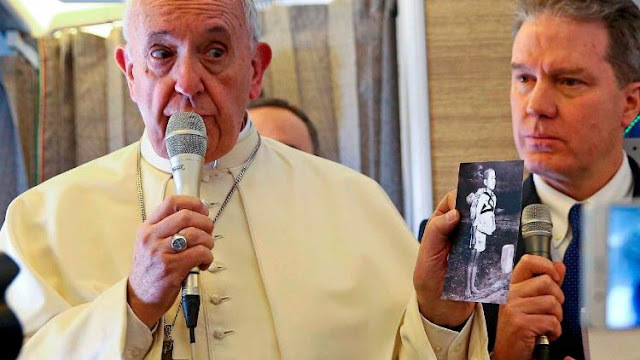 Talking to journalists on the papal plane, he also commented on the image of a young Japanese boy carrying the body of his baby brother on his back as he waited in line at a crematorium in the city of Nagasaki. The Pope had ordered cards to be printed and distributed to journalists with the photo on one side and the words: ‘the fruits of war’ printed on the other, alongside his signature. The shot was captured by American Marine photographer Joe O’Donnell in the days following the U.S. nuclear attack on the city in August 1945. The Holy Father said he was very moved by the image and wanted to share it, because of his fears that the world was moving once again towards the use of nuclear weapons. His comments came two days after residents of Hawaii received text messages warning of an imminent ballistic missile attack. The false alarm from Hawaii’s Emergency Management Agency, which was also broadcast on radio and television, was withdrawn 38 minutes later. Last November, the Pope addressed a Vatican conference on disarmament, saying the possession of nuclear weapons is to be “firmly condemned” because “they exist in the service of a mentality of fear that affects not only the parties in conflict, but the entire human race.